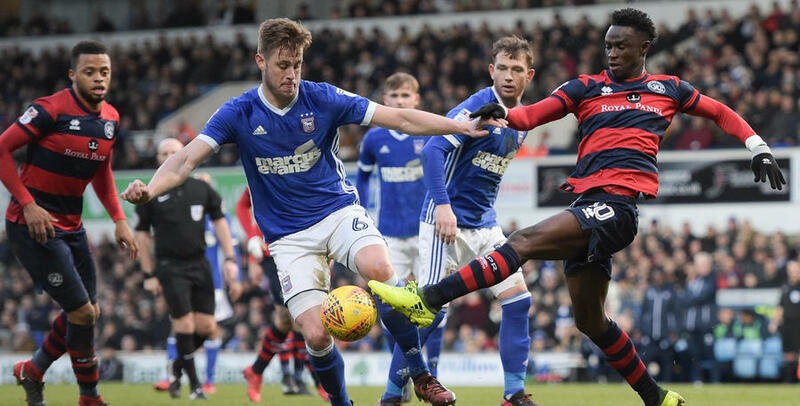 QPR took a share of the spoils at Ipswich Town in a game they finished with ten men after Josh Scowen was dismissed in the closing stages for his second bookable offence. In a match of few clear-cut opportunities at either end of the pitch a draw was arguably a fair result. Ian Holloway made one change from the side that drew with Bristol City three days ago, with Jordan Cousins coming in at the expense of Bright Osayi-Samuel. The R’s lined up in a 3-5-1-1 formation, with Luke Freeman pushed into a more advanced role, operating just off Idrissa Sylla in attack. Cousins took up Freeman’s usual position at the heart of the midfield alongside Josh Scowen and Massimo Luongo. Jake Bidwell and Pawel Wszolek continued in their wing-back roles while Jack Robinson, Nedum Onuoha and Alex Baptiste lined up in front of Alex Smithies. 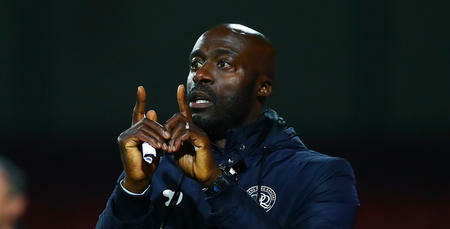 After our winless run away from home came to an end at Birmingham City, Holloway was keen to see his men build on that with another positive performance on the road. Mick McCarthy’s were in good form in front of their own fans, however, having picked up ten points from their last four fixtures at Portman Road so offered a stern test for the R’s. Sitting three points off the play-offs, the Tractor Boys knew they needed to pick up all three points to stay in touch with the chasing pack. Freddie Sears had the first effort of the afternoon in the third minute after Joe Garner set the ball for him on the edge of the R’s box, but his shot was well over the target. A minute later Smithies was called into action to deny David McGoldrick, diving low to his left to push the ball wide after a fierce drive from 18 yards. 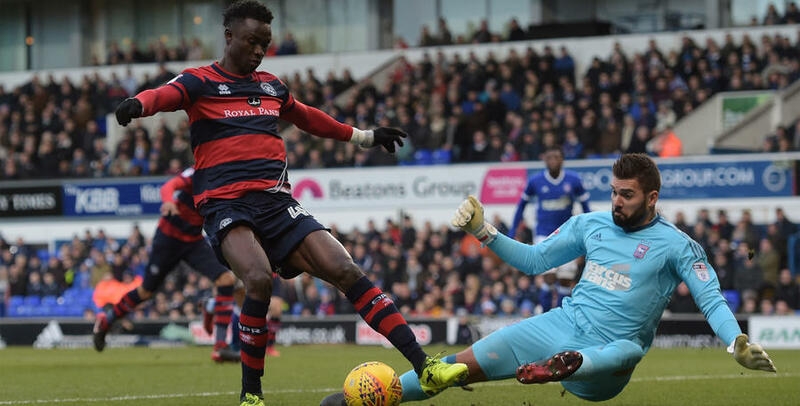 The hosts certainly began the game the brighter although Sylla almost found himself in on goal when Scowen’s shot from distance hit the R’s striker. It seemed to fall perfectly into Sylla’s path, but Ipswich stopper Bartosz Bialkowski was alive to the danger and was able to race off his line to force Sylla wide before the move eventually broke down. QPR soon settled into the game and on 15 minutes Freeman made a great run forward with the ball before playing in Cousins but his shot from inside the box was well blocked by Luke Chambers. On 25 minutes Bidwell was denied by Bialkowski who tipped his effort over the bar from close range following Freeman’s free-kick to the far post. 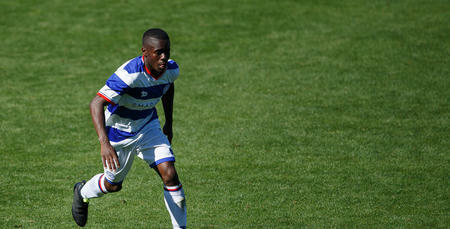 From the resultant corner, Baptiste headed directly at the home keeper who gathered comfortably. It was a good period of play from Holloway’s men although McGoldrick nearly curled in the opener from 25 yards in the 33rd minute. Thankfully for the R’s, his effort drifted just wide of the far post. On the stroke of half-time Callum Connolly warmed the palms of Smithies with a shot from distance but the sides headed into the break with the deadlock yet to be broken. Following the interval, Rangers started the second period strongly. Sylla almost got on the end of Cousin’s fizzed centre from the right, while Luongo had a shot from 14 yards blocked by Chambers. Both teams seemed to struggle to carve out any real clear-cut chances, with the final ball often not being there at both ends of the pitch. With ten minutes remaining, Holloway made his first change of the afternoon with Matt Smith replacing Sylla. Moments later, Osayi-Samuel came on for Cousins, which saw Freeman drop back into midfield with the former Blackpool man working up front alongside Smith. With four minutes remaining Scowen was sent off after being shown his second yellow card of the afternoon for pulling down Grant Ward as he looked to make a run into the QPR box. From the resultant freekick on the edge of the area, Ipswich sub Bersant Celina’s clipped effort drifted just over Smithies’ crossbar. In injury time, Smith burst through the Ipswich rearguard but his shot from 18 yards was straight at Bialkowski, who was able to gather. Osayi-Samuel also went close as the game came to a close. 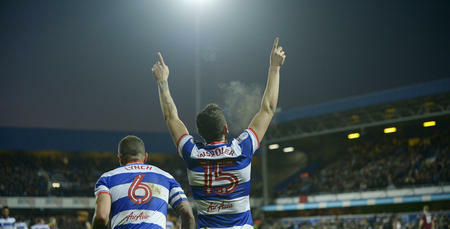 It was a solid point on the road for the R’s ahead of the short trip to Millwall in three days’ time. WATCH highlights from QPR's 0-0 draw against Ipswich Town at Portman Road.